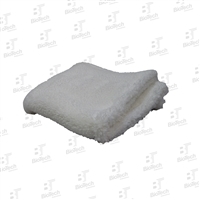 Microfiber Cloth is a great choice for your daily dry and damp dusting needs because it is easiest and safest solution for cleaning almost everything. High grade microfiber specially designed for cleaning glass. Microfiber Cloth is a great choice for your daily dry and damp dusting needs because it is easiest and safest solution for cleaning almost everything. Waffle Cloth M/F Gold 16" x 24"
Microfiber Cloth is a great choice for your daily dry and damp dusting needs because it is easiest and safest solution for cleaning almost everything. Our Waffle Cloth is a great choice for your daily dry and damp dusting needs because it is the easiest and safest solution for cleaning almost everything. Our Waffle Cloth is a great choice for your daily dry and damp dusting needs because it is the easiest and safest solution for cleaning almost everything. Super Plush Microfiber Polishing Cloth- Gray 16" x 24"
Super Plush Microfiber Polishing Cloth- Black 16" x 24"
Microfiber Cloth Plush Blue 24" x 33"
High grade microfiber specially designed for cleaning glass.